This event is part of the School Games programme and is open to all Small Schools* in the Partnership. Quadkids is an exciting and easy to organise athletics concept designed to give more children the opportunity to participate in and enjoy athletics. It covers the core disciplines of running, throwing and jumping in a team format. *The definition of a small school, based on School Games criteria is any school that has fewer than 120 students in KS2 and no more than 30 pupils in Year 6. Teams are made up of 5 boys and 5 girls, with each athlete competing in all events. Individual performances are scored using a points table and the winners are the team with the highest cumulative points score. All athletes take part in a 75m sprint, vortex howler throw, standing long jump and 600m run. The two top placed schools from this competition will go forward to represent South Cambs SSP at the County School Games Summer Finals on Thursday 27th June. Download a manual to find out more about Quadkids and the rules of each event. Please refer to pages 14-18. If you would like some support with introducing or developing Quadkids in your school please contact us. Don’t forget to visit the School Games website where you can download resources to support the delivery of intra-school athletics in your school. More information regarding rules and format of the competition will be sent out closer to the event but schools are encouraged to enter early as there are only a limited number of entries for this event. Fully Booked! 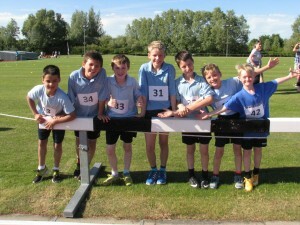 Quadkids Athletics (Small Schools) - 6th June 2019 Free!